We landed in early evening, the sun casting it's yellow shadows from behind the limestone mountains onto the runway. As we skidded to a stop, I peered out the window to see hundreds of years old stone terraces still in tact; slightly crumbling, but their impact on the landscape undeniable. Unlike the weathered terraces on the outskirts of the city, Dubrovnik itself contains one of the more well preserved old towns in Croatia. Never have I seen such a homogenous roof and exterior selection across an entire town (orange terra cotta tiles and local stone or stucco the color of local stone, respectively), the coordination of structures best appreciated from the view at the base of Minčeta Tower during a hike around the city walls. 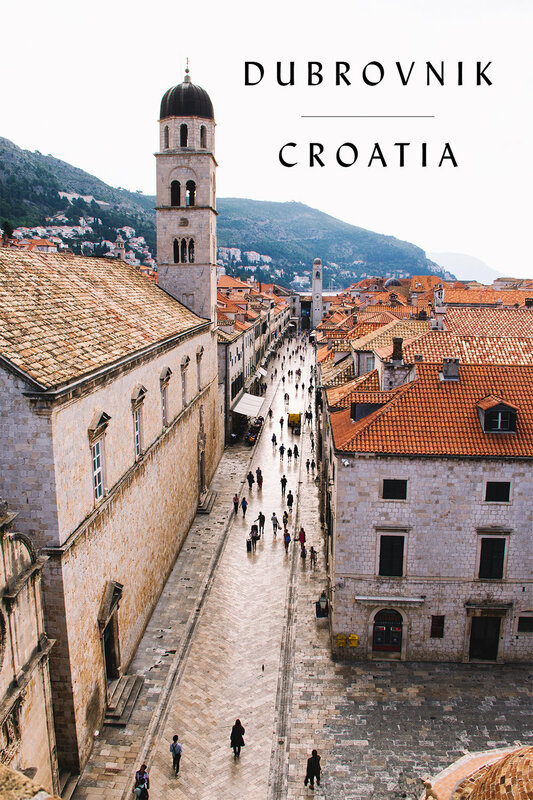 Whether you're visiting this ancient port city because you are a fan of Game of Thrones, or because you're looking for a small city with culture and a nice beach, Dubrovnik serves as a generous host. 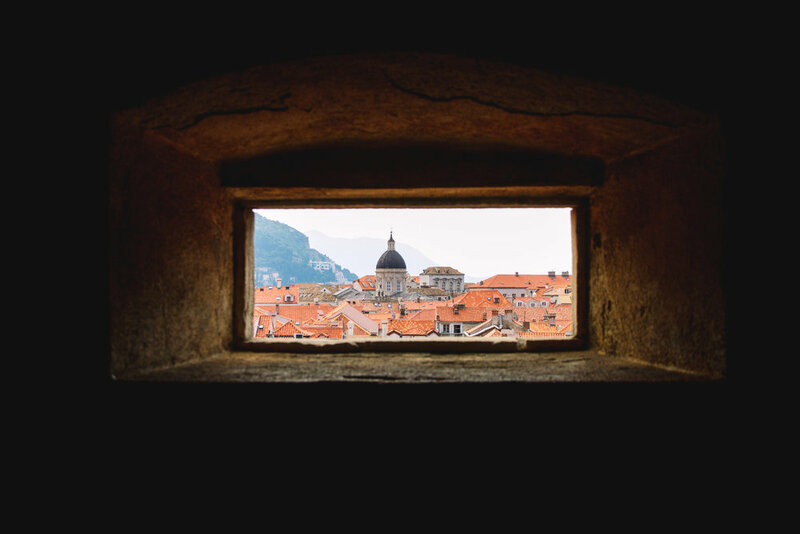 In order to stay inside the city walls, which is ideal for exploring, we recommend staying at one of Dubrovnik's many charming Airbnb's. We stayed at Private Terrace with Old Town Home and loved it. If you've never stayed at an Airbnb before, click here to get $40 off your first trip. HIKE THE CITY WALLS | Rise early to walk the city walls when they open at 8:00am to avoid the crowds. You'll enjoy picturesque views, countless photo opportunities, and get a great grounding on the layout of the city - not to mention a nice workout to start the day so you can enjoy some ice cream guilt-free later. Stop along the 1.2 mile route for a coffee or juice with views of the water. KAYAK | We love being mildly active on vacation and kayaking the calm waters around Dubrovnik provides an arm workout AND another vantage point of the town. Kayaks can be rented through X-Adventure in the west harbor. RIDE THE CABLE CAR | Best experienced at about an hour before sunset, the cable car provides some of the best views of the city. WALK THE STRADUN | The Stradun is a 300m long pedestrian walkway that is the heart of Old Town. Shops and restaurants line the streets and while most of the shops are full of tchotchkes, there a few worthy of stopping into including UJE, a stylish olive oil and olive wood shop that has locations on various islands in Dalmatia. Had Dubrovnik been our last stop (and not our first), we would have picked up an olive wood bowl, an olive wood cutting board, and some olive wood utensils here. DRINK AT A CLIFFSIDE BAR | There are two cliffside "buza" bars in Dubrovnik and both are fantastic places to watch the sunset on the Adriatic. See link and locations below in Where to Eat & Drink. FIND GAME OF THRONES FILMING LOCATIONS | While this is a bit cheesy, it's a fun way to explore the city. Here is a guide so you can do your own self-guided tour. Buza Bar | Wander the perimeter streets of old town and go through a "hole in the wall" when you see a sign for cold drinks. Relax as the sun sets over the Adriatic with a cold drink in hand. If you want a nice seat for sunset, arrive before the sky starts to pink for the best spot. Dalmatino | Make a reservation beforehand and order the žrnovski makaruli with slow cooked beef cheeks (its a traditional pasta dish) and/or the mussels in a cream wine sauce. These were two of the best dishes from the trip. Peppino's | The busiest (and for good reason) of the many ice cream shops in Dubrovnik, Peppino's impresses with their extravagant flavors and beautiful presentation. Oliva | Simple pizza and drinks in a cute setting. Here's a link to all the places we've recommended: Dubrovnik Highlights Map of What to See, Do & Eat.